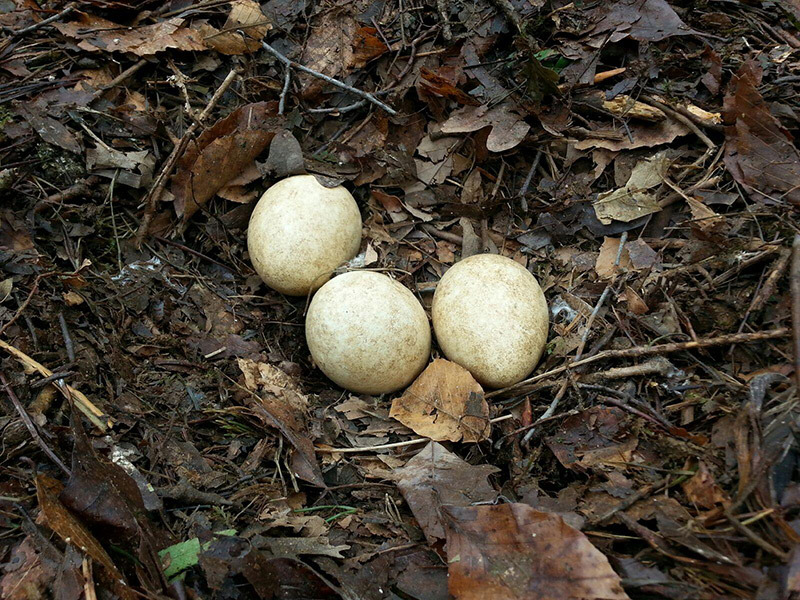 Three eagle eggs, from the nest of Independence and Franklin, non-releasable captive Bald Eagles at the AEF’s Eagle Mountain Sanctuary aviary, hold hidden treasures of life to come. In the early history of our country, the Bald Eagle was perceived by many as a predator and a pest. Bounties were placed on eagles and they were shot and killed by the tens of thousands. Scientific research proved this line of thinking to be untrue. Eagles actually helped maintain the balance of nature, and they did not threaten the salmon population. But sadly, too many people felt otherwise and relied on misinformation to justify the elimination of this majestic bird. In addition to shooting, the habitats of eagles were destroyed as settlers migrated west. Later, chemical runoffs polluted waterways, killing fish and the predators who relied on them as their primary food source. Undoubtedly the most catastrophic threat to the eagle population as a whole was the widespread use of the pesticide DDT. As it entered the food chain of eagles, it caused their eggs to not develop properly. The shells were thin and misshapen, and babies were unable to thrive inside the eggs. 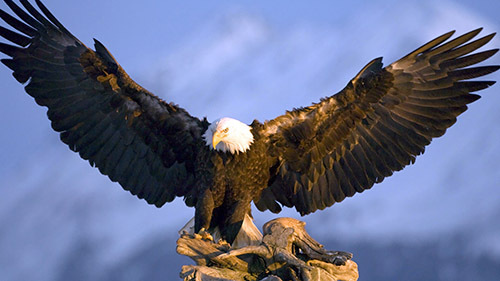 Years went by, and the eagle population in the lower 48 plummeted, with extinction eminent. 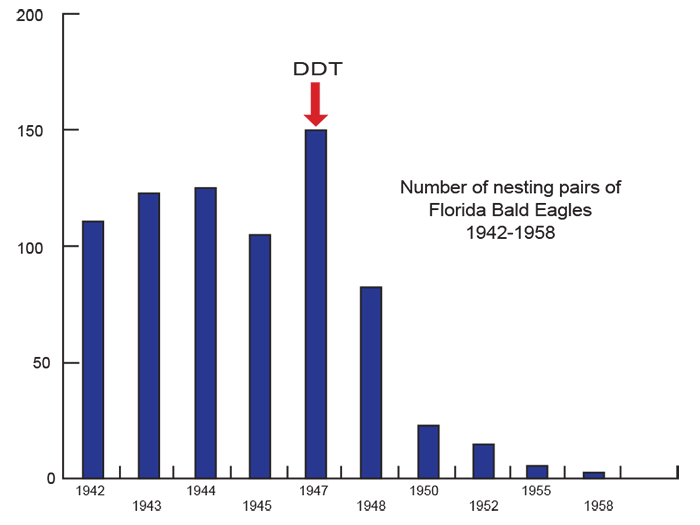 One of the first naturalists to record the dramatic decline of the bald eagle after the introduction of DDT as a pesticide spray was a Florida naturalist named Charles Broley. Broley had been observing and banding bald eagles for years when in 1947 he voiced concern about the reproductive rate of the bald eagle. At that time, few records on bald eagle populations were kept. Therefore, Broley’s records tracing the number of nesting bald eagles in Florida provided some of the first evidence that the bald eagle population was declining at an alarming rate. His research gave solid corroboration to the information widely disseminated by the publication of Rachel Carson’s Silent Spring, a clarion call to environments all over the world. The harmful effects of DDT were proven beyond a shadow of a doubt, and the government banned its use. The chart above illustrates Florida naturalist Charles Browley’s findings regarding the Bald Eagle population in Florida from 1942 – 1958. The trend in this chart was verified around the country, and in 1963 the Fish & Wildlife Service recorded the dismal figure of only 417 nesting pairs of Bald Eagles in the entire lower 48 states. Once DDT was banned, other steps were introduced by which Bald and Golden eagles were reintroduced into areas where their populations had been decimated. State and Federal laws were enacted to protect eagles, and innovative techniques were developed to boost their populations. 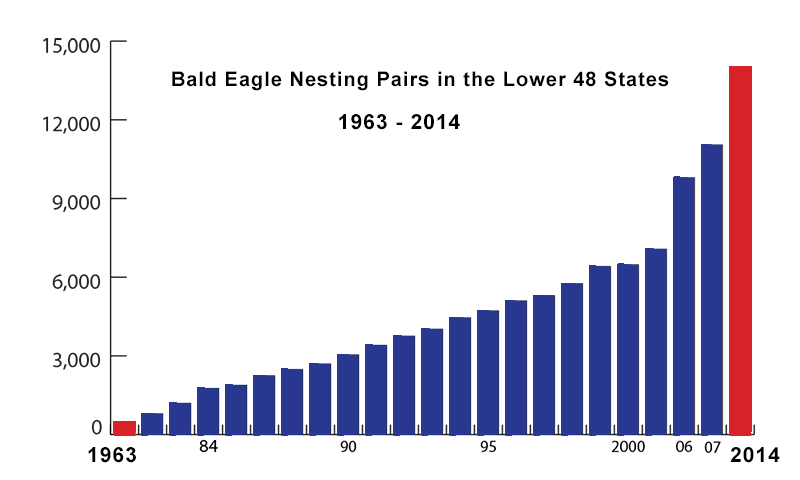 Bald Eagle nesting pairs in the lower 48 states from 1963 – 2014. Bald Eagle restoration in New York is documented in this article.